What if it turns out that YOU'RE the bully - and you didn't know it? Up until now, life has been good for 13-year-old Luke. He's good at sports, attractive, and he's a big wheel at Heyworth Academy, his private school. He likes to tease, and poke fun at the other kids, but that's just because he likes having fun. But things start to fall apart, six weeks into eighth grade, when Luke commits an act of 'goofing around' that ends up costing him his best friend and his beloved private school. After he's expelled, Luke transfers to his local school, Carlyle. Now, he's on the outside looking in. His looks, and background (not to mention his Heyworth hoodie), make him stand out, and the tough guys zero in on him right away. The upside-down world that Luke finds himself in at Carlyle gives him a whole new way of looking at things. 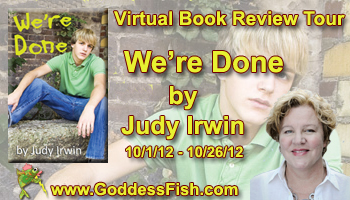 Can he recover from losing his school, and his best friend, and find new friends and a way to fit in at Carlyle? We meet Luke, a 13 year old boy who has everything, good looks, popularity, he's good at sports and goes to a private schools. While he likes to tease kids, he doesn't see it as bullying, until he's made too. Due to the zero-tolerance approach Heyworth Academy takes towards bullying, Luke is expelled from the school he loves and loses his best friend. But in his new school, he's no longer the cool and popular kid he was at Heyworth. He's not the one 'goofing around' and teasing anyone anymore, instead he's the one being teased. Not gonna lie, I didn't like Luke at the start, but I think that's the point, your not supposed to. But as Luke matures and changes and you get a background to him, you sort of understand that he doesn't have the best environment at home and you get a better understanding of why he acts the way he does. Don't get me wrong, I'm not saying this gives anyone an excuse to bully though. Yes he teases kids, but he doesn't understand that what he is doing is wrong and genuinely hurting people. He doesn't see what he's doing as being mean, but as 'having fun'. What I loved about this book was the different approach it took to writing about bullying, we saw it all from the bully's point of view. And it was a big wake-up call to Luke. I enjoyed reading this book, the style of writing was great to read, it was descriptive but not too descriptive and i didn't find myself getting bored. But one problem I had with the book was that I wished it had been expanded more. Some parts, especially the start when Luke was still attending Heyworth Academy, I felt were slightly rushed and moved too quickly. Personally I would have loved to see a bit more of how Luke was like at the private school. I am one of those people who loves to see emotion in books from the characters and I wanted a little bit more here. I think younger children, ages 9-13, would thoroughly enjoy this book. But for young adult readers (I'm in my mid-teens) I think I would have loved a longer story with more detail in some parts. "Luke?" A red flush rose from her neck to her cheeks. "What are you – " She dropped the stapler with a clatter, and bent to grab it. "Tash? Hey, what a coincidence," said Luke. "I go here now. Just started. I guess you go here too. Too funny." "I thought you went to a private school," said the girl. Her face continued to redden. "So what are you doing here — at Carlyle?" "Well, there was a misunderstanding," said Luke. "I mean, the principal at Heyworth misunderstood. Anyway, I’m here now. Don’t like it much yet." He laughed. Tash frowned, and tucked her hair behind her left ear with her free hand. "Wow. Too bad for you, I guess," she said. She cleared her throat. "Well, hi and all, but — I’ve got to go. Say hi to Jon for me. I’ll see you around." She turned and took a step down the hall. "Hey, wait, maybe we can hang out?" said Luke. "You’re practically the only person I know here. In fact, you are the only person I know — well, besides my new friend Mrs. Skelton. Want to meet up for lunch or something?" Tash looked at Luke, and then looked at the floor. "You know what, I’m really busy at lunch," she said, looking back at him. Her neck reddened even more. "I'm in a lot of activities. I don't think I can. Sorry. I’ve got to go. It’s almost time for the bell." She turned again and started walking. "Yeah, OK, whatever," said Luke. "Don't want to take up your time, I guess. See you around." I have to disagree with the comment about YA not enjoying this book. I think they would get as much or more from this story as the younger children. Oh no I definitley agree that YA too would get a lot from the book and also enjoy it, I just meant that the book was perhaps more suited to a younger age group. But I'm sure all age groups would get a lot from We're Done. This has been a great tour. Highlighting an important issue. I have enjoyed the tour and this very important subject.